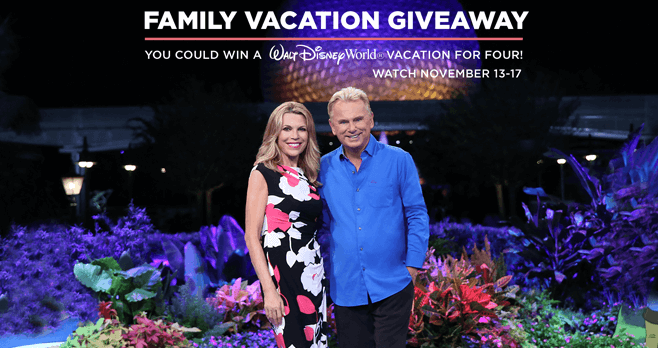 Wheel of Fortune is giving away Walt Disney World vacations for four with the Family Vacation Giveaway 2017 during the Walt Disney World Resort Week on Wheel. Watch for Bonus Round Puzzle Solutions and a chance to win, all week long. To enter the Wheel of Fortune Family Vacation Giveaway 2017, visit www.wheeloffortune.com and access the Sweepstakes entry page. Then, complete and submit official entry form, including the correct Bonus Round Puzzle Solution from the corresponding episode of the Show to receive one Entry into the Sweepstakes. If you are already a registered Wheel Watchers Club member, you will receive one additional entry into the respective daily sweepstakes by logging into the Website using your Wheel Watchers Club email address and password. Limit one Entry and one Bonus Entry per person/email address per Daily Sweepstakes. Who Can Enter? Wheel of Fortune’s Family Vacation Giveaway is open only to permanent legal residents of the 50 states of the U.S., or D.C., who are 18 years of age or older as of November 13, 2017. When To Enter? This Sweepstakes begins at 3:00:00 p.m. PT on November 13, 2017 and ends at 2:59:59 p.m. PT on November 18, 2017. How Sweepstakes Winners Are Chosen? For each daily sweepstakes, one potential winner will be randomly selected from among all eligible Sweepstakes Entries received for that particular daily sweepstakes in a drawing. What Are The Sweepstakes Prizes? Each Grand Prize consists of a trip for a family of four to the Walt Disney World Resort valued at $6,000.